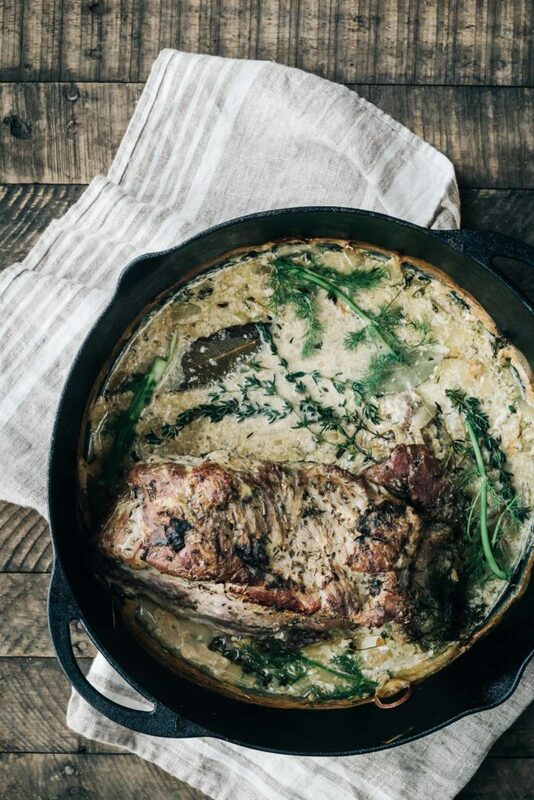 When you simmer a beautiful pork shoulder in a rich broth of milk, cream, vegetable stock, and lots of herbs you end up with a meal that is so out of this world good that you’ll be thinking about it for days. We’re still enjoying pork from our pigs last season (and stay tuned because more pigs are coming to the farm this year too!) and this recipe was a wonderful way of celebrating our tasty pigs. This method of preparing pork calls for leeks and fennel, which caramelize in the milk mixture as the pork braises, providing a slightly sweet and herbal flavor that I adore. The milk does curdle as it braises, but after the pork is done, you remove it from the pot and strain the sauce. Your kitchen will smell divine as the roast slowly cooks and your dinner mates will all thank you profusely (trust me!) This meal is lovely when served with a side of rice, polenta or some good crusty that will help absorbed the sauce. Thank you to my dear friend (and Tumbleweed Farm CSA member) Eva Kosmas Flores for creating this recipe and gifting me with her beautiful new cookbook First We Eat. Her cookbook debuts today and I hope you all check it out! Thanks again Eva for inspiring folks to eat with the seasons and cook good, healthy, from the earth food. Preheat the oven to 325F. Pat the pork shoulder dry with paper towels and set aside. In a large Dutch oven, melt the butter over medium-high heat. Add the fennel bulbs and leeks and cook, stirring every minute, until the layers of the leeks begin to fall out of their rings and the fennel pieces soften slightly, about 5 minutes. In a small bowl, mix together the salt and thyme. Rub the salt mixture all over the pork. Push the fennel and leeks to one side of the Dutch oven. Place the pork on the empty side and sear each side of the roast until deeply golden, about 4 minutes per side, stirring the side with the veggies often to keep them from burning. Add the stock to the pan and stir, scraping up any dark brown bits from the bottom of the pan with a wooden spoon. Add the milk, cream, bay leaves, thyme sprigs and fennel fronds and stir to combine. Cover the pot, leaving the lid ajar by about 1 inch. Place the pot in the oven and roast for about 2 hours, turning the pork every 30 minutes. Remove the lid and roast for an additional 30-45 minutes more or until a meat thermometer registers the meat at 145F. Remove from the oven. Gently remove the roast from the pot and set it aside on a platter. Pour contents of the pot through a mesh sieve placed over a large bowl. Press the bottom of another bowl over the solids in the sieve to help get all the juices out. Discard the solids. Pour the strained sauce back into the Dutch oven and place it on low heat. Add the wine and whisk to combine. Season with salt and pepper. Once the mixture is hot but not boiling, remove it from the heat and return the pork to the pot. Pull the roast apart into large chunks and serve with rice, bread, or polenta if desired. *This recipe is courtesy of Eva Kosmas Flores's cookbook "First We Eat"
If I wanted to make this with a smaller pork shoulder (1.19 lbs) do I just reduce the liquid/cooking time? Yep! I hope you enjoy it! Taste was spot on! I used too large a pork shoulder so didn’t quite get the desired texture of the pork in that amount of time, but loved the meal! We were surprised how much more like a soup it was than a sauce – we served it with a well-soaked, crusty baguette and a side of your maple roasted parsnips from the cook book. Great weeknight meal! I am making this as I am typing. I used a fat strainer when making the sauce, and let it reduce a little so it wasn’t so watery. The pork is INCREDIBLE!! Serving with bread and a salad. My husband keeps asking me when supper is ready! !